All the points illustrated in this article were made by Captain Jeff Gower during a recent tour of duty in northern Iraq. Early afternoons were his most opportune time to flint-knap. His source of material was water worn chert pebbles from the Euphrates River. "Made these on top a three story building---only place I could get any peace of mind"---------2006, Captain Jeff Gower. Jeff Gower has proven that a modern day flintknapper can practice the ancient art of flintknapping almost anywhere. 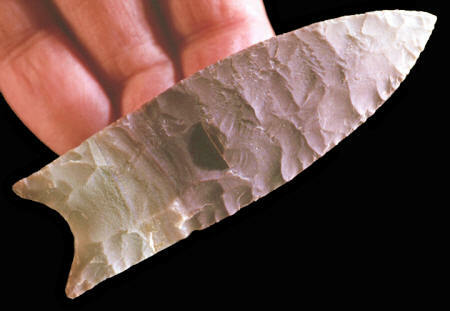 Maybe it's not surprising because there has never been any geographical boundaries to flintknapping even in ancient times, except for maybe the Antarctic. Flintknapping has been applied as a craft for many different reasons for almost as long as humans have been walking the earth. 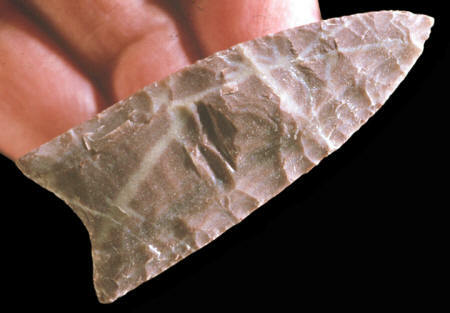 In this case, Captain Gower used flintknapping as a way to escape and relax for a few minutes out of each day. It was his way of taking a break from a stressful life in a war zone. This pretty purple banded fluted point was made by Captain Jeff Gower while serving a tour of active duty in Iraq. This point was made from a chert pebble from the Euphrates River. It measures 3 3/16 inches (8.1 cm) long. Captain Gower is a reserve army officer assigned to the 8th detachment of the 100th division. His duty station was at the Al Kasik military base located in northern Iraq approximately 80 miles northwest of Mosul. He was in country from April 1, 2005 through March 27, 2006. 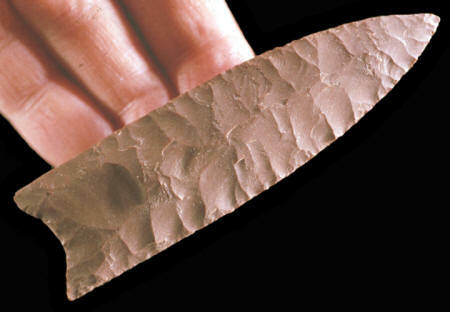 This fluted point represent one of approximately 200 points made by Captain Gower while serving a tour of active duty in Iraq. This point illustrates some of the more colorful chert that was available in the form of river worn pebbles from the Euphrates River. This point measures 2 7/16 inches (6.2 cm) long. Captain Gower didn't plan to make any points while serving in Iraq. There was no reason to believe that any stone would be available let alone a place to knap it. So he didn't bring any flintknapping tools with him. It wasn't until he discovered that gravel brought onto the base from the Euphrates River, for building materials, contained good knapping material. He had his flintknapping tool kit sent over from Illinois and the rest is history. This purple fluted point was made from a pebble collected from gravel brought to the Al Kasik military base in northern Iraq. It measures 2 3/16 inches (5.5 cm) long. Captain Gower found a good place to take his daily breaks. His flintknapping station was located on top of a third story building. He says it was the "only place I could get any peace of mind." 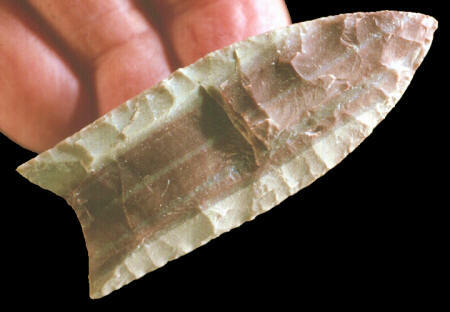 This red colored fluted point was made by Jeff Gower from a water worn pebble from the Euphrates River. It measures 3 3/4 inches (9.5 cm) long. Jeff Gower says he was able to make about one point a day. He says that between the hours of about 12:00 and 3:00 in the afternoon things seemed to quite down. 2006, Personal communications with Jeff Gower.